During the war, Marina Gritsenko lived and worked in Moscow. The diaries that she kept for four years (from 1943 to 1946) tell us much about that period. Both ex officio and from her heart, Gritsenko corresponded with many artists who were combat veterans, and supported them by all available means. She helped them with accommodation, daily living, and the organization of exhibitions, and also gave the artists confidence and strength through her words of encouragement. She was a friend of many famous Soviet artists, including Pavel Sokolov-Skalya, Georgy Vereysky, Yakov Romas, Iosif Serebryany, Ivan Titkov, Solomon Telingater, Alexei Pakhomov, Vladimir Kudrevich, Vladimir Serov, Viktor Proshkin, Vladimir Malagis, Valentin Kurdov and many others. In his memoirs1, Titkov spoke of Marina Gritsenko as of a kind person of heart who rendered him invaluable support during those hard times. Gritsenko wrote that she "was born into and grew up in the world of art"2. Her mother was Lyubov Tretyakova, Pavel Tretyakov’s daughter, her father Nikolai Gritsenko, a marine artist. 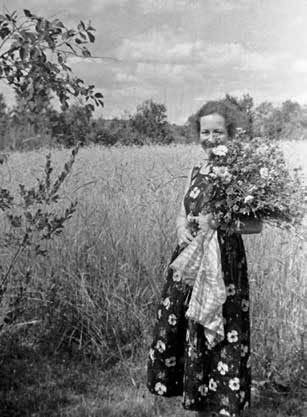 In her early childhood, Gritsenko mostly lived abroad or in St. Petersburg. 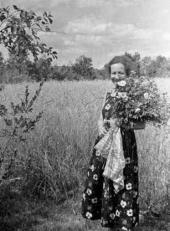 In 1918, she moved to Moscow, graduated from a Moscow public school and was employed by the Main Department of the Textile Industry at the USSR Council of National Economy. But true to her family traditions, Marina ended up as an employee of the Applied Arts Workers’ Union. In 1927, she suffered a severe illness that lasted some months and caused serious complications which would trouble her for many years. In 1929, she took anotherjob at the State Planning committee’s publishing office and from then on her life would be connected with organizational and publishing activities. In 1930, the IZOGIZ publishing house opened, and she became the secretary of the editorial office at the magazine "Artists’ Team". 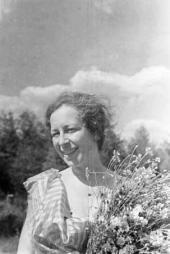 At the same time, from late 1932 on, she held the position of managing editor at "Iskusstvo" (Art) magazine at the Moscow branch of the Soviet Artists’ Union (SAU). In 1936, for health reasons, Gritsenko had to quit both positions and took the job of senior editor-manager at "Iskusstvo" publishing house. In 1939, she became an employee of the Organizing Committee of the Artists’ Union of the USSR and worked there as an adviser until the end of her life. 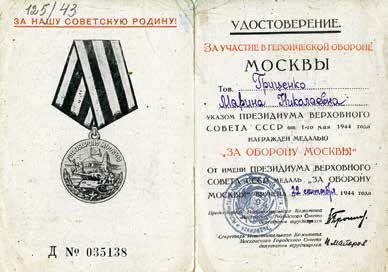 During the Great Patriotic War, Gritsenko stayed in Moscow as a member of the Organizing Committee’s executive group. She participated in the preparations for the "Heroic Front Line and Home Front" exhibition which was held at the Tretyakov Gallery; she also travelled to Kiev to organize the 5th Plenary Meeting the Artists' Union of Ukraine. 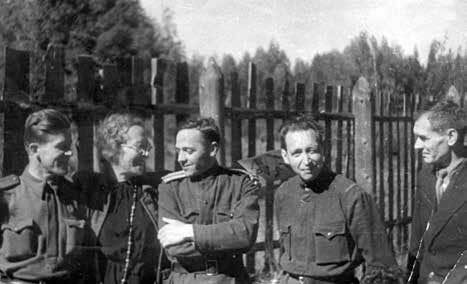 In summer 1943, she spent a week in Leningrad, sorting out the Tretyakov archive that had been found at the hermitage. 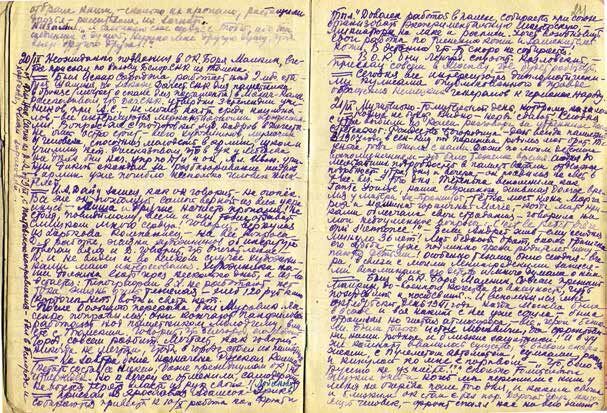 Gritsenko started her first diary on January 1 1943. Daily, she recorded events as they happened: she wrote of meetings, trips, telephone conversations and letters received, of the affairs of the Organizing Committee, developments at the front and, of course, of her thoughts and feelings. 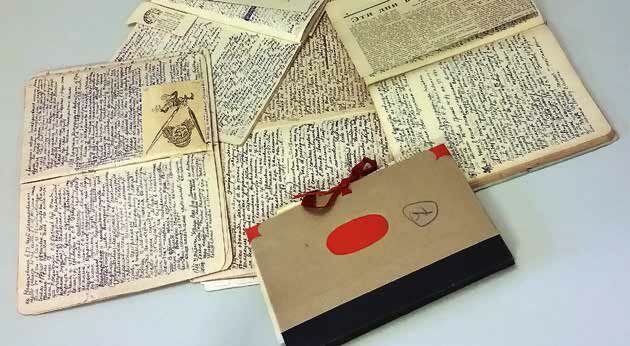 her private archive includes 12 notebooks written in a small hand. sometimes, when she did not have a notebook or a notepad to hand, she had to glue together separate sheets. Perhaps she thought to use those diaries as a basis for her book entitled ‘Art Workers during the Great Patriotic War". Gritsenko devoted much of her time to this work, collecting extensive material, but the book was never published. 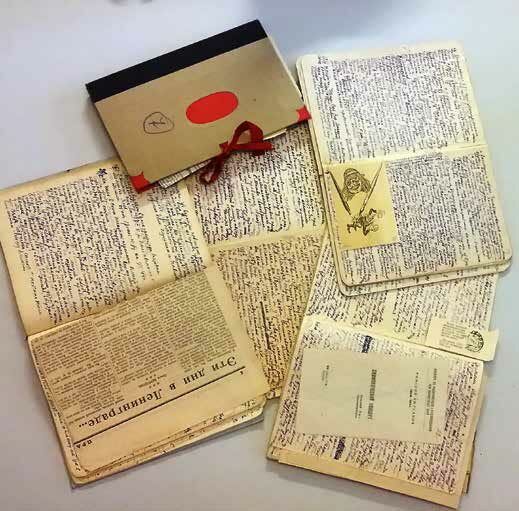 In addition to the diary entries, the notebooks contained inserted invitation cards for exhibitions, concert programmes, newspaper clippings, theatre tickets and draft letters. Marina Gritsenko's diaries have never been published before and or been used by researchers of the Great Patriotic War. However, these materials provide information that sheds light not just on Russia's cultural life during the war, but also on the everyday life of ordinary Russians, with all the hardships and troubles of war time. These excerpts from two notebooks are published here for the first time. They tell us about the lives of many famous artists from Moscow and Leningrad, about the SAU Organizing Committee's work, about preparation of various exhibitions and conferences, but they also describe the war-time situation in the country: the lack of essential goods, the distribution of food and clothes, the destruction and bombing of different cities. The author's reflections on the horrors of war, on its consequences and significance for every individual, on the price of victory and on the future, accompany records of actual events. The diaries are published in accordance with modern rules of spelling and punctuation. The author's style has been preserved. 19.08. The last days were cold and rainy. Today, however, it is one of those fine days, precursors of the coming autumn, with splendid weather, perfect air and a light fresh breeze. High tufted clouds cast distinct, intricate shadows down below. The Moscow-Volga [canal] waters glint in the light and shadow. How beautiful nature is in this part of the Moscow region: leafy and coniferous forests intersperse picturesquely with strangely shaped "seas", lakes, channels, rivers, and creeks. The entire country is covered with silver water-"veins", resembling a unique nervous system. Harvest time has passed, and the shocks of wheat in the fields stand like checkers on a board, properly aligned. Most trees still keep their green "attire" but sometimes a little aspen flashes up or a birch shows yellow here and there. As we move northward, the colours turn simpler and bleaker and the landscape changes. The woods grow thinner, the marshland becomes more extensive, turf moors appear. The church buildings also undergo a transformation, losing their soft, round shapes peculiar to the Empire style. How marvellous is Russian nature, from above its beauty even more remarkable. And now we see the more distinctive marks that the war has left behind: buildings burnt and destroyed, trees blown down. After 45 minutes of flight, a soldier comes to the machine-gun that has been set on a platform in the middle of the plane (the soldier does not leave the spot until we approach Leningrad). Our plane descends and the flight continues at a height of 300 metres. The plane's big, dark shadow follows us close by over the tree tops and marshes. Unexpectedly, the landscape changes and becomes hilly, spotted [with - N.B.] occasional ravines and covered with fir and pine trees. The plane suddenly gains altitude and then descends abruptly, landing in an airfield at "Khvoinaya". The flight from Moscow takes us an hour and 45 minutes. It is cold, the rain drizzles and there are puddles underfoot. Anti-aircraft guns are booming in the distance - apparently, there is an air raid on Leningrad. We've landed at Smolninsky airfield, 30 kilometres away from the city. But what a sight to see! Three rockets hover over the city - huge, bright-orange, egg-shaped - emitting a phosphorescent glow. I was told that they floated on automatic parachutes, swinging slowly. Our guns shoot at them but the rockets are hard to hit as, due to the parachute's automatic contraction caused by a shockwave, the rocket moves: a light, smooth bouncing movement - and here it hovers again in another place, swinging slowly. The rockets' glow and the gunfire sometimes turn night into day, and thanks to this light, we can reach the control room in 15-20 minutes, walking over mud and puddles... It's past one a.m., a bus arrives and its Moscow-bound passengers fill the room. The four of us board the bus and set off for Leningrad. The moon shines, making the highway dazzling white. This night recalls August nights in the Crimea. We are about to leave the airfield zone and the last pointsman has checked the driver's permit. As we move through the suburb villages and approach the city, the devastation increases and becomes more and more remarkable. It is hard to accept the scenes around us as reality, as something that actually exists. You feel like a spectator at a grandiose tragic play. The moonlight and contrasting lights and shadows turn blocks of fantastic lacy ruins and piles of rubble left after the collapsed buildings into theatrical decorations... There is no sound and no people... All the streets and squares have been cleaned up, and the silence of the city makes it even more remarkable. It creates the atmosphere of a great antique tragedy… Oh, my city, how beautiful you are even in disaster, you bear your hard lot with such great dignity and poise! And though at night you seem to be void of life, one still can feel your stoic, indomitable spirit! We drive through Okhta, Suvorovsky Prospekt and see the extent of destruction which is so great that I hardly know my way around. For the most part, the buildings have been damaged and for sure, not a single window has been left intact. As we move towards the centre, we see all the facades walled up and windows covered over with plywood. From Zhukovsky Street we make a turn on to Volodarsky Prospekt and then stop at building 48 - Aeroflot. Oh, my city, the city that filled my life with joys and sorrows… Today you embody suffering, sacrificing thousands of victims and living through despicable horrors in expiation for the sins of my generation - the generation which, according to my friend Nikolai Rylenkov6, "God rejected". Great is your purification that has been obtained through death and hardship, tears and misery. Great are your defenders who gave you courage and perseverance and rekindled your will and Faith. And your revival - how splendid and majestic will it be. But the day is still to come when your heroic deeds will be fully acknowledged and appreciated. Today the human mind just makes its first attempts to break through to you, registering some facts and documenting events superficially. These days I was overwhelmed with so many emotions! The developments at the front sometimes make you feel that all you have lived through is just a dream; also, what we have endured in those hard times - could it be real?! The contrast between the present-day and memories of the past is so stunning that at times you cannot believe that your lifetime spans both realities. Joy?! But the past is filled with so much sorrow - it is impossible to forget. Can the feeling of joy - no matter how great and embracing it is - supersede this sorrow or compensate for our losses? To me this joy seems affected, as if we try to simulate it artificially. But… as years, worldly wisdom, and life experience put it bitterly but honestly: "Time is the best cure" - it lightens all burdens, relieves all sorrows and makes up for lost happiness. We are on the eve of great events. It is so hard to outlive one's own self. There is nothing to wait for, there are no more illusions. Oh, the nearest and dearest who departed this world… sometimes your fate seems sweet to me. At times, loneliness becomes too heavy a burden and seems impossible to bear. But… we will brace ourselves up and try to bravely wend our way through life, as before. Today they published the order to remove the black-outs. For 1.480 days Moscow was dark. What a joy! - There is no need to wall off the world any more; one will be able to breathe in the summer, to enjoy light and air, and to live like a human being, not like a mole. Tonight they have already lit the lights on the Theatr[alny] Square, in front of the Bolshoi Theatre. 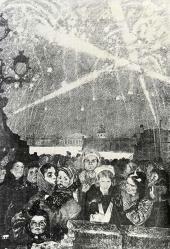 The light, bright and dazzling (or so it appeared), illuminated the square and the huge crowd that gathered there; people stared up, bewildered, and this feeling seemingly overtook them all! …There will be fireworks - to commemorate the fall of Berlin. 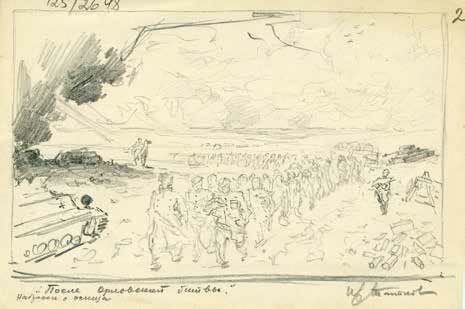 Levitan's voice, when he read the Army and Fleet Order, was more solemn that usual. I did not feel excited as now that already accomplished fact did not stir up any unusual emotions - the ones that I had anticipated experiencing while waiting for this day. I walked over to the corner of Tverskaya and Ogarev Streets and, standing at the destroyed building site near the "The Motherland Is Calling!" panel picture (by Irakli Toidze), listened as the announcer read the order again and again. 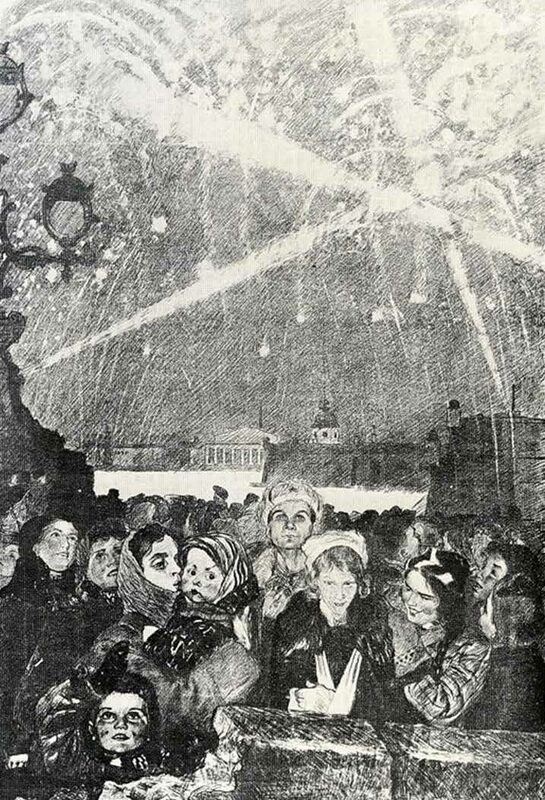 The crowd was not very dense - people waited for the fireworks; strolling in groups along Tverskaya, they did not appear either too excited or joyful… The street was bright with light; the lamps and the globe at the entrance of the Telegraph building were lit and the globe was turning. The people stood around in silence. I looked at their faces - they were tired; there were many young people, mostly high school students - girls dressed-up, boys loud with their recently gained understanding of manhood's value. Elderly women who had obviously paid too high a price for this war stood gravely, each one of them lost in her own grief. The one who stood by me cried. What contrast, what moments of the present - at a time like this, the price we all paid feels particularly bitter and painful! I stood on the spot that had been of historical value to all of us who lived through the siege of Moscow… In the last months of 1941 and in early 1942… it was the central operational point in Moscow, the place where all our combat veterans met, as most of them did not know the city… "At the main Telegraph building". During daytime, an anti-aircraft gun vehicle was positioned there; there were military cars all around, painted in camouflage green or white, according to the season. What character types one could see there! 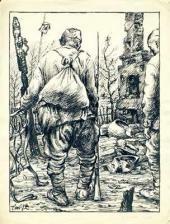 The faces of the soldiers of the time cannot be forgotten, especially those of the Siberians, our saviours. Glory be to them forever! - This place - it was a city nerve; there one could find out what was the situation on the front, and the city caught its spirit. It was a memorable, hard but wonderful time - the days when, poised for defence, teeth bared, closing its ranks like a single family, implacable and formidable in its determination to stand up against the enemy, the city laid the foundations for the victory and conceived the day that we are living out today. Those days were real, and they passed into silence, only to be remembered forever - for life's sake! Titkov, I. 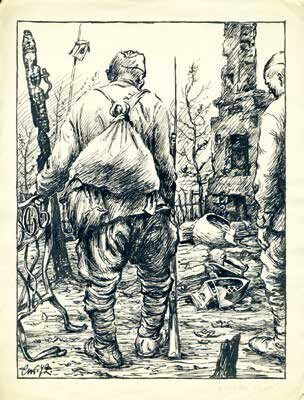 In 'Battles for Moscow' //"Khudozhnik" (Artist) magazine. 1985. No. 5. Pp. 14-29. Gritsenko, Marina. "Autobiography". 1954. Department of Manuscripts, Tretyakov Gallery. F. 125. Item 68. Sheet 1. Gritsenko, Marina. "Wartime Notes". Notebook No. 3. August 19-27 1943. Department of Manuscripts, Tretyakov Gallery. F. 125. Item 87. Sheets 9-23. Iosif Serebryany (1907-1979), Soviet artist, People's Artist of the USSR, member of the Leningrad branch of the Soviet Artists' Union. 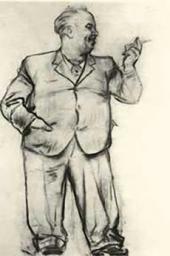 Vladimir Serov (1910-1968), Soviet painter and graphic artist, chairman of the Leningrad branch of the Soviet Artists' Union. 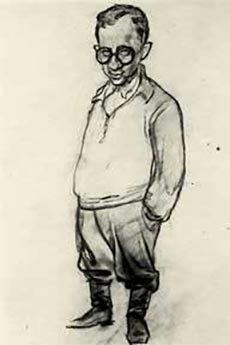 Nikolai Rylenkov (1909-1969), Soviet poet and writer. Gritsenko, Marina. "Wartime Notes". Notebook No. 10. March 5-July 5 1945. Department of Manuscripts, Tretyakov Gallery. F. 125. Item 99. Sheets 83 rev.-92 rev.